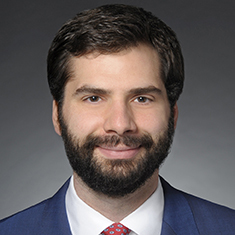 Elliott M. Bacon concentrates his practice in litigation and enforcement matters relating to the financial services industry, white collar cases and internal investigations, and other complex commercial litigation. He has represented clients before federal and state courts, arbitrators and mediators, and various governmental regulatory bodies and self-regulatory organizations. Additionally, Elliott served as a judicial clerk for the Honorable Joan H. Lefkow of the US District Court for the Northern District of Illinois. Elliott graduated first in his class from the University of Illinois College of Law, received the Rickerts Award for Academic Excellence, and received CALI Awards for Excellence in Evidence, Criminal Procedure: Adjudication, Federal Courts, Criminal Procedure: Investigations, Administrative Law, Environmental Law & Policy, Professional Responsibility, Business Associations I, Fact Investigation: JFK Assassination, Property and Legal Research. During law school, Elliott was the executive production editor of the University of Illinois Law Review, a research assistant to Professor Laurie Reynolds, a teaching assistant for Property and Legal Writing, and a judicial extern for the Honorable Blanche M. Manning of the US District Court for the Northern District of Illinois. Shown below is a selection of Elliott’s engagements.